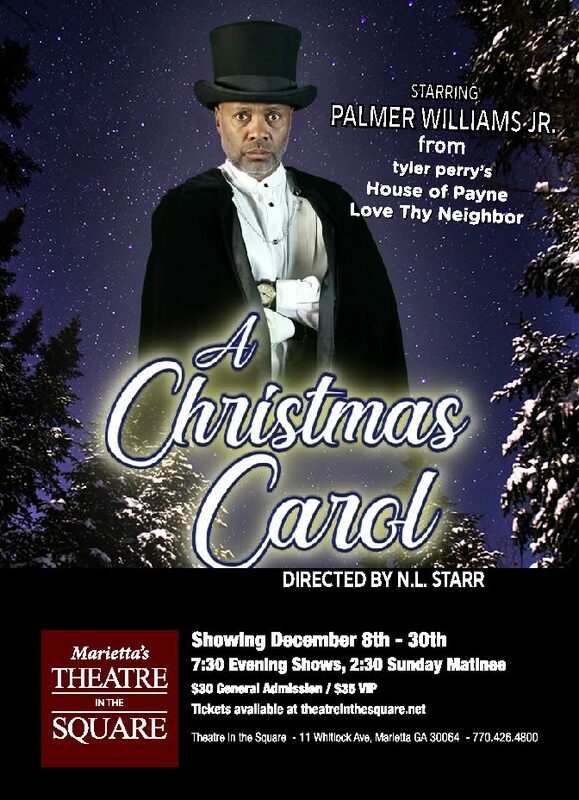 A Christmas Carol Starring Palmer Williams, Jr., from Tyler Perry’s House of Payne and Love thy Neighbor, as Ebenezer Scrooge. A Christmas Carol tells the story of Ebenezer Scrooge, an old miser who is visited by the ghost of his former business partner Jacob Marley and the Ghosts of Christmas Past, Present and Yet to Come. After their visits Scrooge is transformed into a kinder, gentler man.This performance will entertain the Whole Family. Come out and see this Christmas classic brought to life by Atlanta’s best local actors and stars. Parking is free anywhere on the square daily Monday through Friday after 6 pm and all day Saturday and Sunday. If you cannot locate a parking spot on the street, you may find parking at Marietta Square East Parking Deck located 1 Haynes St, Marietta, GA 30060.